This is the full photo of the two combined pictures above. This is a palette that I made up from a sample kit that I sell. It consists of 6 colors... Red, Blue, Yellow, Burnt Sienna, Black and White. Some others that sell these paints insist that people buy many, many colors, sometimes talking them into buying a $1200 kit. I find that to be nonsense and totally ridiculous. With these 6 colors, you can see what colors I have made up. Those are only some of the colors that can be made from such a small amount of colors. If later, the artist wants to spoil themselves and buy a bunch of colors, that is their choice... it isn't necessary and personally, I think it is a waste of money. My kits will consist of 6 colors like stated above. They come in 1 oz. jars and that amount will last a very, very long time. The kit will include one of my instructional DVDs videos to choose from. Along with the kits that I sell, you will be given one on one help from me for any questions you may have after receiving your paints. I love these paints and know them well and easily help you. I can also communicate with my customers using Skype, which I will give my customers my information after purchase for easy communication. The purchase price of my kits are $100 plus shipping. This is normally the cost just for the paint and they do not include instructional videos specifically for the Genesis, or offer any online instruction! It is a very good deal for those who decide to join my Genesis Paints world! No more wasted paint! 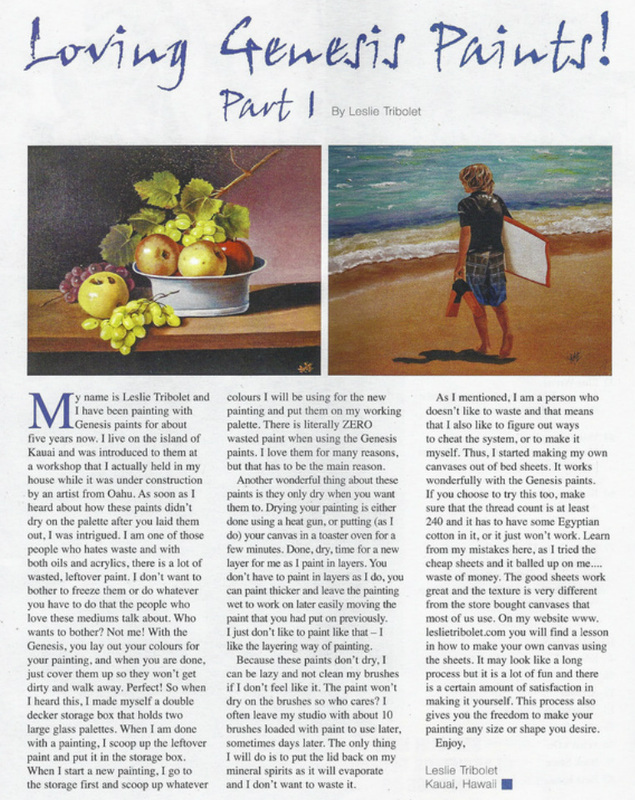 No more toxins and the paint will produce beautiful colors for your paintings. Check out the following page to view some of my work all done in Genesis. Please fill out the form below for any information on ordering and I will be in touch! I use Paypal for payment as it is easy to sign up, easy to use and safe for both of us. Hope to hear from you! 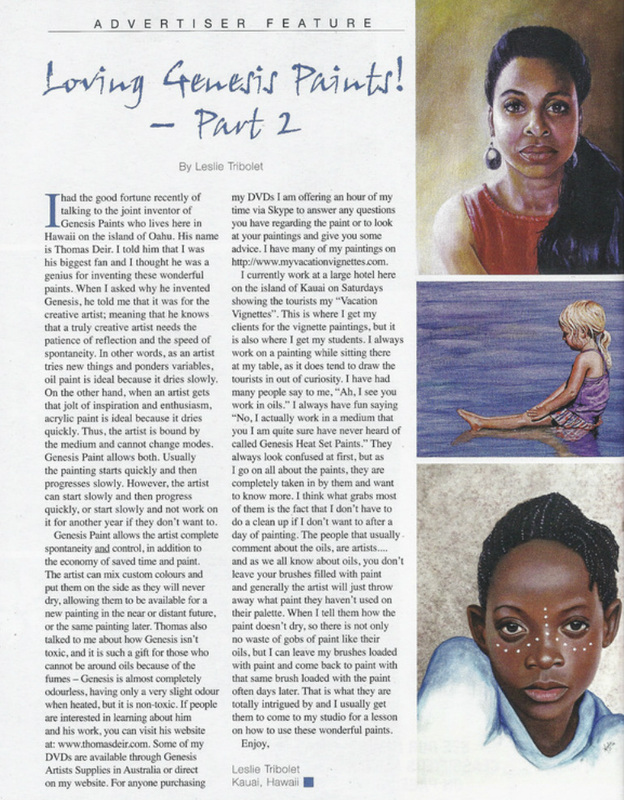 Here below is a two part magazine article I wrote for an art magazine in Australia.